Let’s face it, us soft and squidgy humans don’t react particularly well to radiation, the vacuum of space or hypervelocity meteoroids. This being the case, how do we ever hope to settle on other worlds, particularly worlds with dust for a backyard and a sky flooded in radiation from the Solar System’s biggest nuclear reactor (the Sun)? To put it mildly, it’s not going to be easy. In fact, exploring and settling on other celestial bodies will the the biggest challenge us terrestrials will face in the next century. So we start thinking locally, we start thinking “familiar”; where could we build a habitat that’s a stone’s throw from Earth, where we can do a full-scale practical test of our colonizing skills but be only a couple of days from home? The Moon is that world and we are currently stumbling our way toward that goal. 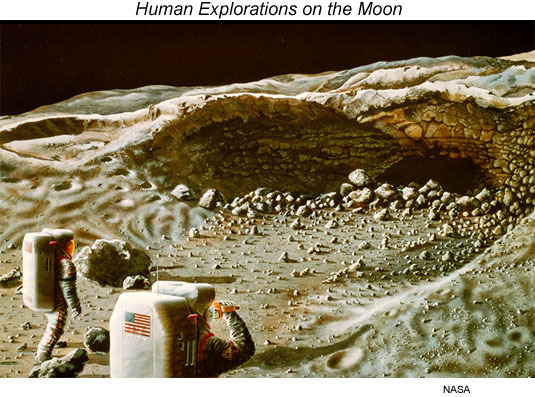 In fact, it is (currently) one of NASA’s main priorities, to get man back to the Moon by 2020 (although the Augustine Commission report was released today and presents many more options for the future of NASA). Once we do eventually get back to the Moon, our lunar explorers will use man made habitats, but what about longer, more permanent settlements? In-situ mining of materials for building habitats and using the landscape to protect settlers isn’t a new idea, but we are beginning to acquire better observations of the Earth’s only natural satellite. 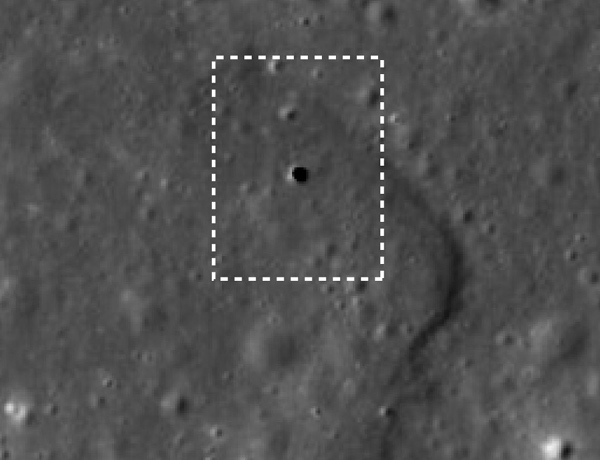 And now, observations from the Japanese Kaguya spacecraft (that was deliberately crashed into the lunar surface in June) have been used to scout out a possible location for a future permanent habitat. It may be hard to believe, but the Moon was once a very hot body, where molten rock began to cool shortly after formation. This molten rock eventually solidified, but in doing so, lava burrowed out long channels known as sinuous rilles. These rilles are a sure sign that lava once flowed there. However, scientists have known for some time that beneath these rilles, lava tubes may also hide. The lava tubes formed when the remaining molten rock flowed away, leaving an encrusted layer of rock surrounding a closed network of tunnels. However, this is the first time a hole in the roof of one of these lava tubes has been found. This hole, for obvious reasons, has been dubbed “a skylight,” and Junichi Haruyama and the SELENE/Kaguya team have been working hard to seek out such features. Their hard work has just paid off. “This is the first time that anybody’s actually identified a skylight in a possible [lunar] lava tube,” said Carolyn van der Bogert, a co-investigator on the team from University of Münster in Germany, of the discovery in a region of the Moon’s near side in Marius Hills. The skylight measures 65 metres wide and it is thought to extend 80 metres deep. The hole is right in the middle of a rille, indicative of the presence of a lava tube 370 metres across. It is currently unknown whether the skylight allows access to the lava tube (access may be blocked by rubble or solidified magma), but there is the tantalizing possibility that this hole could be used by astronauts to access an underground cave. “Basalt is an extremely good material for radiation protection. It’s free real estate ready to be exploited and modified for human use,” said Penny Boston of the New Mexico Institute of Mining and Technology in Socorro. It’s not exactly a leap of the imagination that locations like the Marius Hills skylight could become very valuable regions when space agencies and potential lunar companies need a permanent foothold on the Moon. Until we are able to set foot back on the Moon’s surface, we must rely on robotic explorers to do the reconnaissance work (indeed, that is the main priority for NASA’s Lunar Reconnaissance Orbiter, a satellite capable of snapping images 10× sharper than this Kaguya picture), but the fact remains, features like this are very appealing to help protect us humans from the ravages of space. Bored of the Moon? Set up home in a Martian divot! *Technically, it would be a “condo“; anyone living in the lava tube would own the space inside, they wouldn’t own the lava tube itself. We all know that no one can “own” the Moon don’t we? You can throw away that “Congratulations! You’re Now The Proud Owner Of One Acre Of Lunar Real Estate!” certificate, it’s about as valid as those “I Need Your Bank Account Details To Deposit $1 Million” Nigerian royalty emails. Source: New Scientist. With a special thanks to @foundonmars for the tip!